All transactions are safe and secure with a reliable history in online purchasing behind each of our associates. 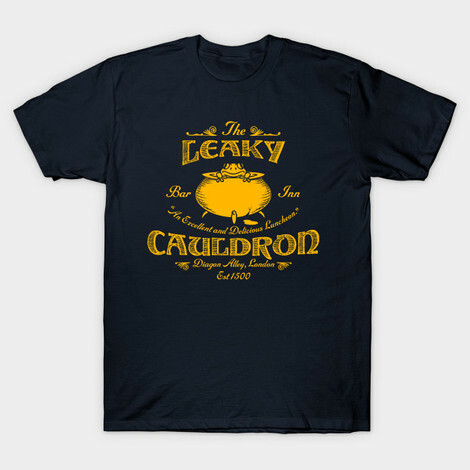 Buy The Leaky Cauldron t-shirt to own Harry Potter clothing and merchandise. The Leaky Cauldron is the name of a pub in London in J.K. Rowling's Harry Potter books. These Leaky Cauldron Harry Potter t-shirts celebrate that pub, which can only be seen by wizards and witches. The pub, run by a bartender named Tom, is a hangout for magical folk and it provides housing as well. A passageway from the courtyard of The Leaky Cauldron pub leads to Diagon Alley, the wizard shopping district in the Harry Potter series of books. In addition to The Leaky Cauldron tee above, browse the Harry Potter Clothing Gallery for more apparel like men's and women's clothes, kids shirts or hoodies.